Experience the ultimate lifestyle that awaits you and your guests for your next Holiday in this Brand New Architecturally designed, master built property we call the Pacifc Breeze' which is perfectly orientated to maximise the water and skyline views with the contemporary statement defined by a comfortable open floor plan, luxury finishes, designer details. Set within one of the most desired pockets of Broadbeach Waters, you are within walking distance to the Broadbeach shopping and dining hub, the beach, Pacific Fair Shopping centre, Jupiters Casino, the Convention Centre and a GLink light rail station. 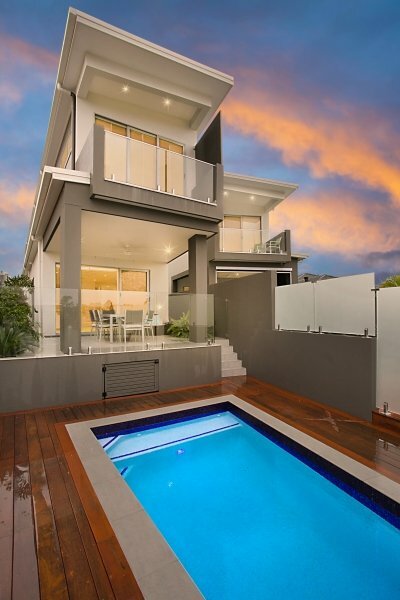 This immaculate property consists of five bedrooms, four bathrooms, a powder room, Bi-fold glass fronts allow open-plan lifestyle space to provide interaction with the covered waterfront alfresco entertaining terrace where decking besets both private inground pools ahead of the tranquil water outlook. The bedding configuration is Bedroom 1 King Bedroom 2 King Bedroom 3 Queen Bedroom 4 Queen Bedroom 5 has 1 x bunks with a double on the bottom and a single on the top and another single bed.